Pacquiao combined speed and power in dominating Cotto, flooring the Puerto Rican twice and transforming his face into a bloody mess before finally stopping him early in the final round. Pacquiao's victory sees him confirm his status as the world's best pound-for-pound boxer and takes his record to 50 wins, three defeats and two draws with 38 knockouts.Some ring observers believe Pacquiao has now won world titles in seven weight divisions, a boxing record, but only five of his title wins came in fights sanctioned by one of boxing's four major bodies - the WBC, WBO, IBF and WBA. 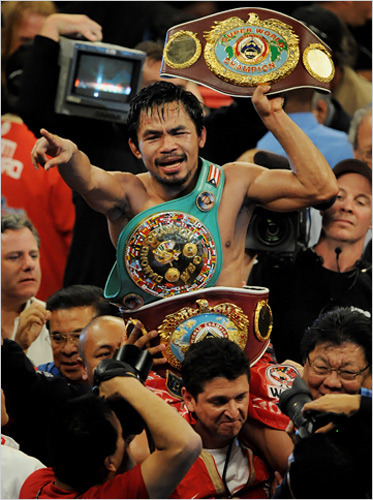 Pacquiao has collected belts, from lightweight to now welterweight and every belt in between. He entered Henry Armstrong territory, earning comparisons to the boxer who won three titles in 10 months in 1937, when there were only eight divisions. Galing!